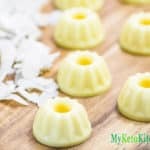 Keto Pina Colada Fat Bombs - Low Carb "Pineapple & Cream" Recipe - DELICIOUS! A simple and very tasty snack that tastes just like a classic, our Low Carb Pina Colada Fat Bombs will take you back to those wonderful summer flavors. Without the need for sugar and alcohol. Dissolve the gelatin and erythritol in the boiling water in a heatproof jug and add the pineapple essence. Add the coconut cream and rum extract and continue stirring for 2 minutes. Pour into silicon molds and set for at least 1 hour, depending on the size of your mold. Gently remove from the mold and enjoy. Store in the fridge.